Set the scene for a festive and nautical holiday with our 56-inch seagreen linen Christmas tree skirt. 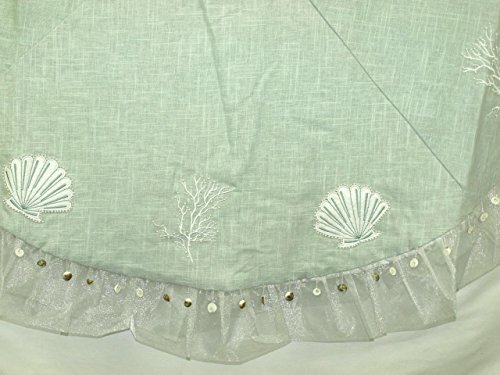 Featuring appliques of white seashells and coral along with elegant gold sequins along the edging, this simply elegant seagreen linen tree skirt is a must-have underneath your evergreen Christmas tree. If you have any questions about this product by Seasons Designs, contact us by completing and submitting the form below. If you are looking for a specif part number, please include it with your message.